In order to meet help the people of Uttar Pradesh find employment opportunities the state government of Uttar Pradesh launched the Uttar Pradesh Berojgari Bhatta Yojana in the year 2012. There are many youth in the state those are educated by are still unemployed due to the lack of opportunities. This comes a great problem are it leads to the economically weakening of the family of the person who is not employed and this leads to the downfall in the economy of the state. So to help such people in running their families the government Uttar Pradesh will give the unemployed an allowance in order to motivate the unemployed people and also to help their family. Under this scheme the eligible unemployed person of the state will be given an unemployment allowance of Rs.1000 per month. For availing this benefit the person apply for the scheme through the scheme form that available online. This scheme is applicable for the residents of the state of Uttar Pradesh only. The domicile certificate has to be submitted during the application procedure. Also a residential proof has to be given in the form of telephone bill or electric bill, etc. The scheme is available for application of those who are registered members of the Sevayojana Offices. The application form is available in the following website- sewayojan.org. The candidate applying for the benefits of the scheme has to be at least a class 10 or high school pass. The minimum age of the candidate applying for this scheme has to be 30 years and not less. The maximum age limit of this scheme is 40 years. Also the person should not be employed in any government, private or public sector jobs. Proper age proof has to be given, based on which your application will be approved or rejected. It has also been mentioned that the candidate applying for the Berojgari Bhatta should have a total family income of not more than Rs.36000 in a year. And for applicants who are applying under the Un-married female, widow or divorced female category, the family income should not be more than Rs.150000 in a year. Income certificate of the family has to be submitted during the application. In order to continue with the scheme benefits the beneficiary will have to submit an affidavit to concerned department annually stating that he or she is not employed in any job in any employment sector. Application can be done both online and offline for this scheme. This scheme is available for the people who are registered to the Sevayojana and the application form is available their offices as well as their official website. Download the form from the website or from the office and fill the form with the details that has been asked in the form. Once you have completely filling the form submit it. In case you have filled the form online then take a print out of the acknowledgment form and keep it for further reference. There will be no application fee required for applying for this scheme. You will need a list of documents for applying for the Berojgari Bhatta, they would include domicile certificate, address proof, income certificate, high school mark sheet, bank passbook page copy, and a copy of a valid ID proof. Even though this scheme was launched in the year 2012, the government had stopped the scheme in the year 2013. But now again the scheme has been re-launched and it will run with the same features. 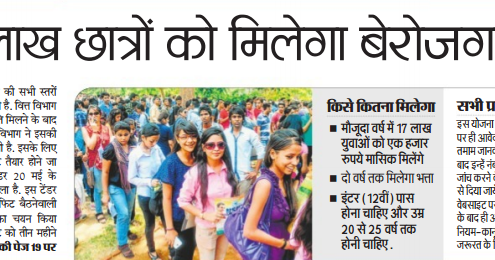 This surely comes as a good news for the unemployed people of the state of Uttar Pradesh.